CAIR-AZ Wishes You A Blessed Ramadan! 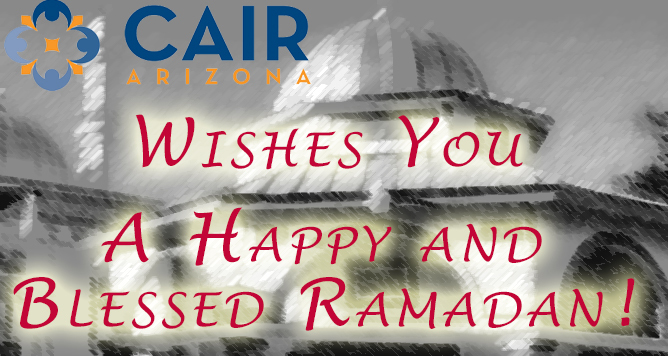 Ramadan Mubarak from CAIR Arizona! Ramadan is the 9th month of the Islamic calendar and is the month the Qur’an was revealed to the Prophet Muhammad (pbuh). Because the Islamic calendar is lunar based, Ramadan changes through the seasons year to year. This year, Ramadan falls in one of the hottest months in Arizona. Muslims will abstain from food and drink from dawn to sunset. That means that Muslims living in Arizona will observe their fast for approximately 15 hours a day during this month. So why do we fast? Ramadan is a time of spiritual development. Although we abstain from food and drink as a means to become closer to God, Ramadan is about much more. In an authentic narration from his life, the Prophet Muhammad (pbuh) said: “Whoever does not abandon falsehood in word and in action, then Allah is not in any need of him leaving his food and drink.” Muslims use the month of Ramadan as a time to perform good deeds, strengthen good characteristics and to abandon the bad ones. Muslims engage in increased worship during Ramadan. Many Muslims will spend nights at the mosques praying special “taraweeh” prayers where the entire Qur’an is recited in prayer. Muslims will also personal time studying the Qur’an and in individual prayers. This usually intensifies during the last 10 nights as Muslims seek to reap the rewards of worshiping on the “Night of Power” – the night the Qur’an was revealed and the reward for a single good deed is equivalent to performing that good deed for 1,000 months. In addition to increased worship during the month of Ramadan, Muslims also celebrate by increasing generosity. During this month, Muslims are encouraged to increase their charitable spending and to share food with our neighbors. You will often see Muslims inviting family, friends, neighbors and colleagues over for Iftar (meal to break the fast) to share meals with loved ones. Many mosques also host Iftar meals every day during the month and open to all members of the community, both to Muslims and to our neighbors of different faiths. Click here to find a mosque in Arizona near you. We ask that you keep CAIR-AZ in your prayers during Ramadan and we wish you all a month filled with blessings and mercy!